The Place Who doesn’t know Max Brenner? If you don’t, you are truly missing out. The Israeli chocolate bars (as they called it) can be found in various countries and of course in our sunny island, Singapore. All its bars have a similar look – brown walls, wooden furniture, huge chocolate mixer and its signature Bald Man. Always packed with a crowd, do avoid the weekends and after meal hours. The Food Everything about chocolate, nothing less. Warning: You better a be chocolate fanatic before stepping into the bars. 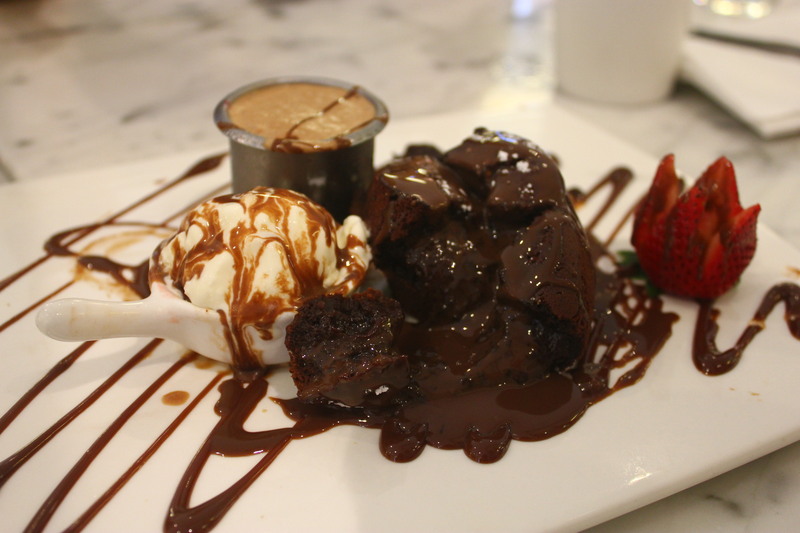 The Deep Fudge Chocolate Cake was definitely one of the best molten chocolate cake tRP ever had. Done with a chocolate frap and vanilla ice cream to complete this heart-melting dessert. Too sinful, too good. With many variations of chocolate desserts on Max Brenner’s menu, some of the other must-tries also includes the waffles and the delectable fondues! This ‘Drink Me’ cup made me laugh. This ‘Dark Chocolate‘ classic made me awe. There’s a choice of Dark, Normal or Milk chocolate for their classics, just choose the one you like the most! Rants Service was bad, or in fact, missing at the Chocolate Bar. But with such tantalizing sweets, you might just be all too forgiving. Will I return again? For tRP’s love of chocolate, yes. Chocolate overdose, no way!